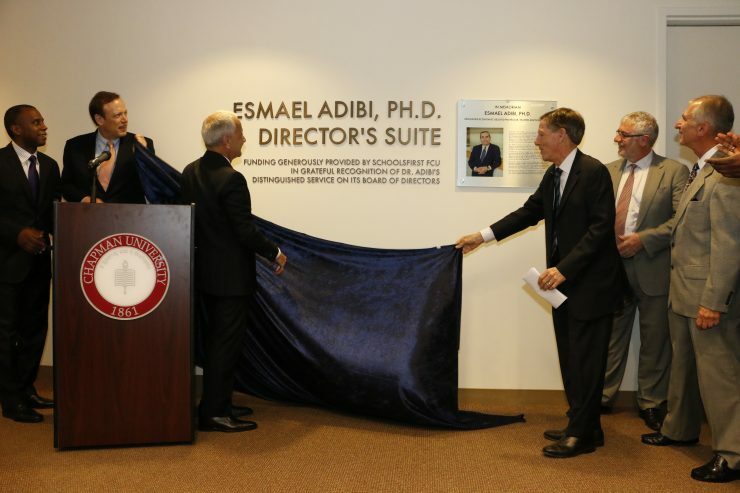 A group of Chapman University offices has been named the Esmael Adibi, Ph.D. Director’s Suite, in homage to the beloved professor who led the A. Gary Anderson Center for Economic Research for three decades. 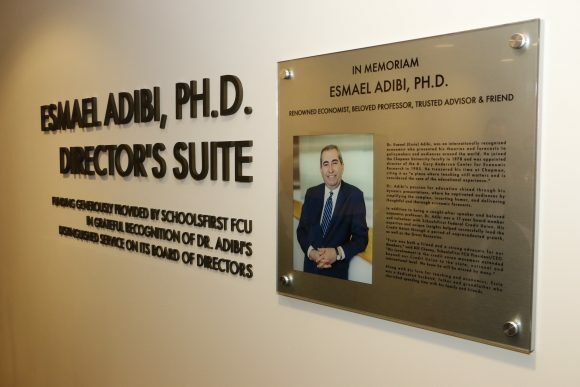 The tribute honors Adibi’s intellectual contributions to the field of economics and his devotion to teaching, as well as his 17 years of service to SchoolsFirst Federal Credit Union, which made the Beckman Hall suite naming possible with a generous donation. Friends and colleagues speaking at the Tuesday, Feb. 21, dedication ceremony recalled Adibi as a consummate educator, friend and community leader. “He will be remembered as a dear friend and trusted advisor whose unsurpassed economic insight allowed the credit union to minimize risk and secure our members’ best interests time and time again,” said Marc Ecker, Ph.D., a director at SchoolsFirst. “He had the unique ability to ask the right questions at the right time to help us stay true to our mission and remain financially strong, most importantly for the members we serve. Adibi, who passed away in 2016, served 17 years as a board member and volunteer at SchoolsFirst. 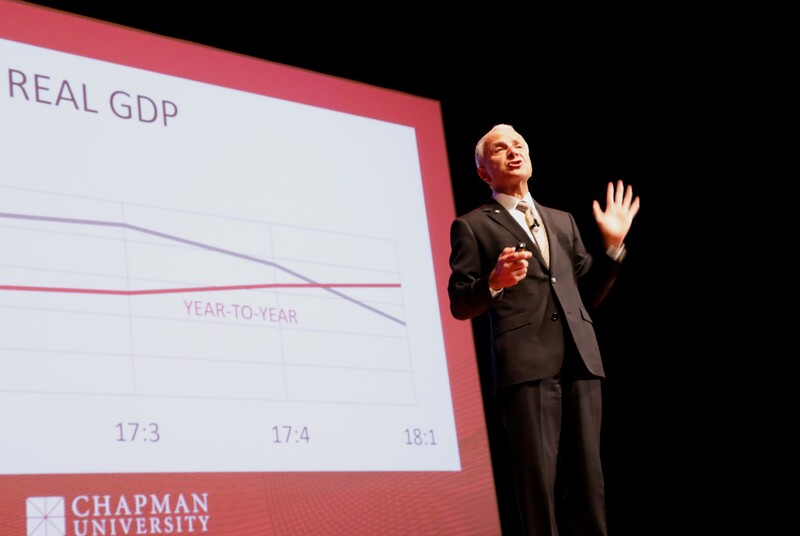 But many of the county’s business people and civic and community leaders knew him for his engaging presentations at the Chapman University Economic Forecast, when he would weave together down-to-earth information and intellectual insights about regional and state economics. 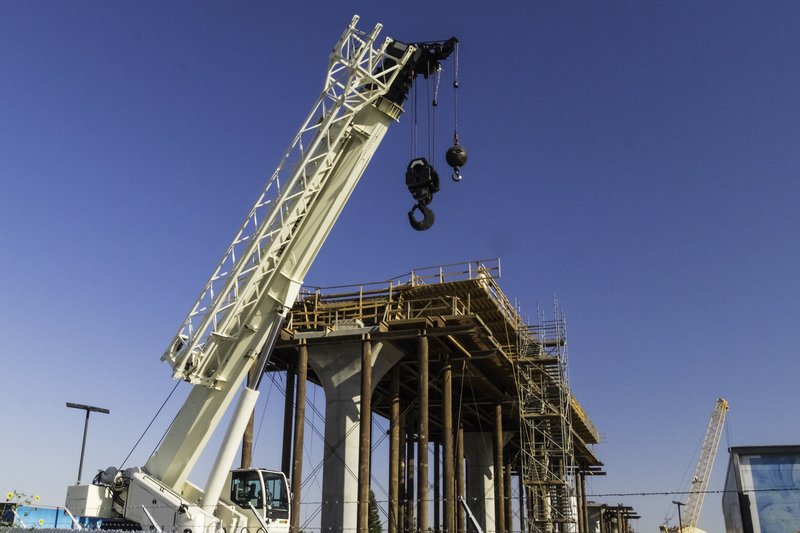 Year after year, in boom times and bad, Chapman’s forecasts of the national, state and Orange County economies were much anticipated and widely discussed in the news media and business world. His entertaining manner was one reason, but so was accuracy. In late 2007, the Anderson Center predicted a recession in 2008. The report cited housing among the factors and anticipated “a sharp increase in foreclosures” ahead of what became known as the Great Recession. 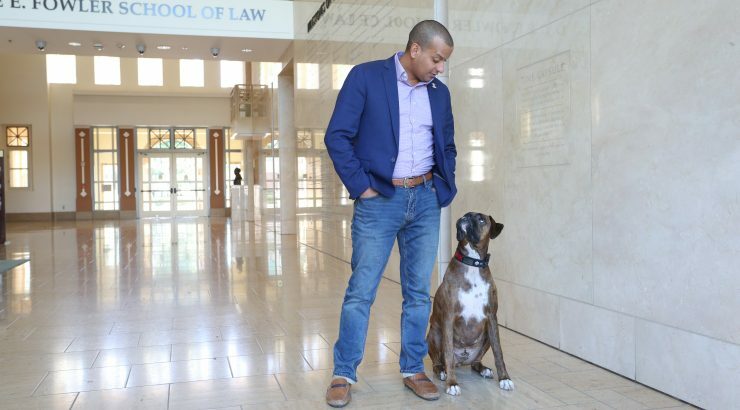 Read a tribute to Adibi written by President Emeritus Jim Doti in the June 2016 issue of Chapman Magazine. Display image at top/ Unveiling the plaque honoring the late Professor Esmael Adibi, Ph.D., are, from left, Reginald Gilyard, dean of the Argyros School of Business and Economics; Bill Cheney, president of SchoolsFirst Federal Credit Union, President Emeritus Jim Doti; Marc Ecker, a SchoolsFirst director; President Daniele Struppa; and Raymond Sfeir, professor and director of the A. Gary Anderson Center for Economic Research.